Jaipur : India’s first all-electric car expedition christened ‘Mahindra Reva Goodness Drive – Kashmir to Kanyakumari’, which recently flagged off by Mahindra Reva Electric Vehicles Pvt Ltd, has already traversed over 1200 km and 14 locations, to reach the city of Jaipur. Three expedition ready, all-electric, zero emission Mahindra E2Os are being driven to Kanyakumari (Tamil Nadu), covering the entire length of the country in a month. The drive was flagged off from Srinagar by Arvind Mathew, Chief Executive Officer, Mahindra Reva, in the presence of Aravinda De Silva, Former International Cricketer from Sri Lanka. Pitched as a drive for a better tomorrow, the E2O convoy will pass through 52 locations within the country and traverse a distance of over 5,000 kilometers. The idea for the ‘Goodness Drive – Kashmir to Kanyakumari’ is to demonstrate the advantages of electric vehicles, thereby helping in the manifestation of a clean and green eco-system. The rally will also propagate a zero emission, zero fuel drive in addition to showcasing the full potential of a connected car and dispel any myths related to range anxiety. It is the right opportunity for the company to demonstrate the many aspects of the car - its ability to traverse tough and difficult terrain, accelerate instantly, its shortest turning radius and the convenience of clutch free driving. 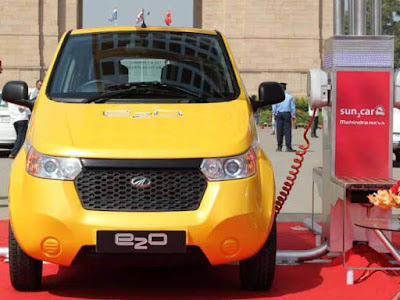 Arvind Mathew, Chief Executive Officer, Mahindra Reva said, “Mahindra E2O is the Mahindra Group’s endeavor to offer its customers a clean, smart and economical personal mobility solution and thus redefine sustainable urbanization. To create awareness of the benefits of electric mobility through Mahindra E2O, we are pleased to flag off the Goodness Drive." "As a pioneer of electric vehicles and integrated mobility solutions in India, it is our effort to make EVs more accessible in order to build a cleaner tomorrow. By traversing this vast distance, our E2Os will look to effectively dispel the range anxiety amongst customers and will demonstrate the car’s ability to handle difficult terrain.” He added. The Mahindra E2O is a manifestation of Mahindra’s vision of the ‘Future of Mobility’ which encompasses the ‘5Cs’ framework of Clean, Convenient, Connected, Clever and Cost Effective vehicle technology. The Mahindra E2O is an Electric Vehicle (EV) designed as a mobility solution for a sustainable zero-emissions society and gains high relevance in the face of issues like environmental degradation, pollution related health concerns, climate change, energy security and rising oil prices, all of which plague communities globally.